Thanks to your participation and support, OhmyNews is welcoming in a new spring filled with hope for the New Year. February 22nd was OhmyNews' birthday. 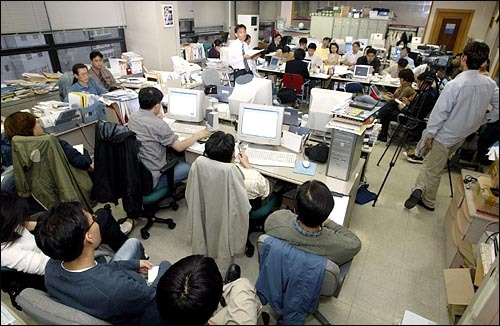 In 2004, the 22nd of February fell on a Sunday, so we held a party two days early, on Friday the 20th, when we held a roundtable discussion by news guerillas and a party for the OhmyNews family. We would again like to thank all those who participated and gave wise words of advice. On January 1st, we declared we would become a "Third Generation Internet Newspaper." All internet news sources prior to OhmyNews were "first generation." The OhmyNews you know and love today is a "second generation" online newspaper. Now, OhmyNews aims to become a "Third Generation Internet Newspaper." As a Third Generation Internet Newspaper there will be five major goals. 1) Achieve qualitative development of citizen participatory journalism. 2) Go beyond criticism of the existing social establishment to propose alternatives for a new society. 4) Globalize OhmyNews, a native Korean product. 5) Create financially stable and sustainable alternative for the news media. On the occasion of its fourth anniversary, OhmyNews commences on the work of establishing itself as a Third Generation Internet Newspaper. We will actively implement your many suggestions and pursue the more multifaceted participation of citizen reporters. The "Reporters' Club" section will be vastly improved to allow for more passionate involvement, and facilitate better communication between OhmyNews' full-time reporters and citizen reporters. We will give positive consideration to proposals about a citizen ombudsman and having a "citizen editor for a day." In addition, citizens will be able to participate in video and audio formats instead of exclusively with written articles. OhmyNews Begins "Citizen Anchor News"
OhmyNews was born with the motto "Every Citizen's a Reporter," and now will create an environment where "every citizen is a broadcasting reporter." OhmyNews' web broadcasting unit, OhmyTV, has been completely redone and made more prominent. "Citizen Anchor News" began last week, and is the first attempt anywhere to have regular citizens do the news. As always, OhmyNews will continue to provide our readers lively coverage of the news in action, and will gradually increase regular programming. OhmyNews International began operating on the occasion of our fourth anniversary, and this marks the beginning of the globalization of a native Korean product, OhmyNews. In March, OhmyNews International will begin translating five to six major articles daily, then gradually expand to allow the citizens of the world to participate by writing their own articles in English. 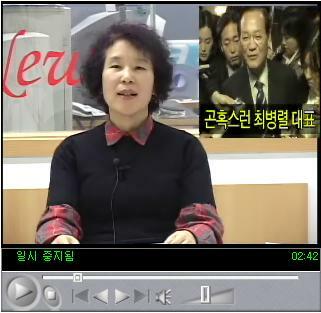 Until now, "Every Citizen's a Reporter" has been applied only to speakers of Korean. Now it will grow to include people everywhere. Preparations for OhmyForum began in earnest late last year with the goal of having OhmyNews become a forum for the news that provides responsible alternatives, and in doing so goes beyond mere criticism of the mainstream media. OhmyForum will significantly explore various alternatives being proposed for our society, and organize offline forums through which to establish alternative agendas. Regarding regular OhmyNews articles as well, OhmyForum will serve to continue the fresh news coverage unique to OhmyNews while encouraging better presentation and suggesting alternatives for that coverage. In 2003, OhmyNews barely earned itself into the black, and for the first time. Your voluntary payments played a major part in achieving a profit. We thank you again and ask for your constant support. In 2004 we will continue to create diverse sources of revenue as we strive to create stable income. We are out to prove that OhmyNews the alternative internet news source isn't going to just appear like a flare and then disappear. We will show that OhmyNews is a stable and viable model. The creation of a Third Generation Internet Newspaper will be possible with your participation. We will be hard at work. We ask for your criticism and encouragement.